The Cortland 444 Classic Peach has stood all the tests that generations of anglers have thrown at it. Extremely supple in the hand, fast through the guides, high floating, precise tapers for ease of casting, turning over long fine leaders. The 444 stays flexible in any water. The Cortland 444 Clear Camo is made with a supple, cystal clear intermdiate coating over a subtly mottled monofilament core that is extruded and dyed with earth-tone tints in Cortland, New York. 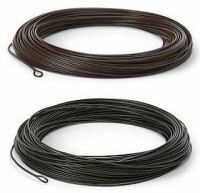 The result is one of the most popular and effective clear intermediate fly lines for stillwater angling in the world. It blends in with any sub-surface environment to virtually disappear in the water while slowly sinking at 1.25" to 1.75" per second. Supple in the coldest water, it's ideal for shallow water fishing for spooky trout. 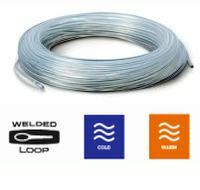 A welded front loop makes rigging leaders fast. Designed by top American nymphing expert Denny Rickards, the new Cortland 444 7' Clear Camo Ghost Tip is the ultimate stealth line for use in clear waters and flat calms. The olive green floating section - as used on the Cortland Clear Creek - is combined with a 7' Clear Camo tip to make it the most spook-free line in the business. This line is set to become a firm favourite. Get your fly down to the feeding level of the fish. Cortland's 444 Classic Sink Tip line features a 10-foot fast-sinking (Type 3) tip for fishing streamers, nymphs and other sinking flies in deeper water and faster currents. The supple, super-smooth finish of the floating section shoots with authority and mends with ease, while the sinking tip gets the fly down where you want it, or more importantly, where the fish want it.